There is a traditional approach to jumpshots in basketball games that was established very early on: press and hold the shoot button, and release it at the right time for the best chance of making the shot. Dice rolls behind the scenes determined the chance of a shot going in, and as games became more sophisticated, individual player ratings also affected those odds. 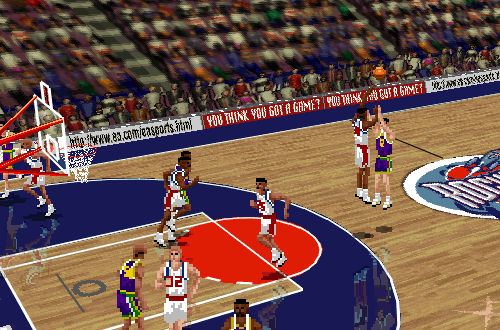 Some games had more cumbersome shooting mechanics, such as NBA All-Star Challenge which required gamers to press the shoot button to initiate the shot, and then press it a second time to release it. Whatever the method, it came back to the same basic principle of releasing the ball at the appropriate time. The “hold and release” method proved to be the most logical and intuitive, which is why it’s still used in modern games. Today’s titles have also adopted the concept of a perfect release point – the Green releases – that are guaranteed to go in unless the shot is blocked. This represents years of fine-tuning and experimenting with the shooting mechanics, in order to make them viable. Despite the simplicity of taking jumpshots with this method, if you go back and play an old basketball video game, you’ll find that jumpers are far less reliable than they should be. This is because the controls are simple enough, but the underlying mechanics weren’t as easy to master. Most manuals and strategy guides advised releasing the ball at the top of the player’s jump, and in theory, that’s a straightforward technique. However, the exact window for success was unclear and imprecise, with a lot of jumpshots that looked like well-timed releases clanging off the rim. Long-time basketball gamers may remember trying every single trick in the book to maximise the chances of a jumpshot going in: pinpointing a certain part of the animation, holding down turbo, not holding down turbo, faking the shot first to pick up your dribble and set your feet, and so on. If something appeared to work, we stuck with it until the shots stopped falling again. This lack of precision and clarity in shooting mechanics meant that if you wanted to score with regularity, you tried to get inside for a dunk or layup. The only time you’d take a jumpshot is if you had a good look from three; as that old strategy guide for NBA Live 96 noted, the difficulty of making jumpshots rendered anything other than a three an unnecessary risk. This trained basketball gamers to ignore the midrange for the most part, which usually meant that old school sim titles weren’t played quite as realistically as intended. It was an adjustment to play a more realistic style of virtual basketball when shooting mechanics finally made it possible. Ironically, this was much less of a problem in the old arcade games. 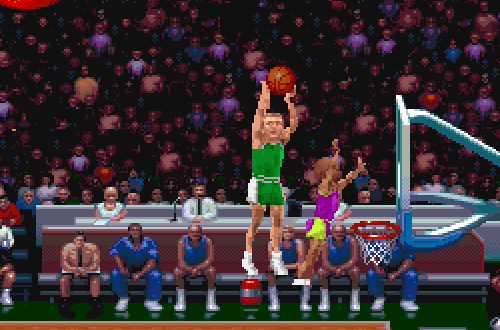 Despite having gameplay that was more suited to ignoring the midrange in favour of going for dunks and layups or gunning from downtown, games like NBA Jam would actually reward gamers by changing it up and shooting a sixteen-footer every now and again. Arcade games also relied on releasing the shoot button at the right moment to maximise your chances of making the shot, but were far more forgiving as the style of play relied on a quick pace with plenty of scoring. Percentages aside, the sim games of the era could have taken some cues from NBA Jam as far as making jumpshots viable for users. As technology improved and developers continued their efforts to make games more and more realistic, various attempts were made to improve shooting mechanics. A few games, such as NBA Inside Drive 2000, were early adopters of a shot meter, which provided a prominent visual cue for the ideal release point and immediate feedback on how close you were to that mark. It was a solution that had a lot of merit, as evident by its eventual adoption by NBA Live and NBA 2K, but it could be confusing when the dice roll didn’t go your way. 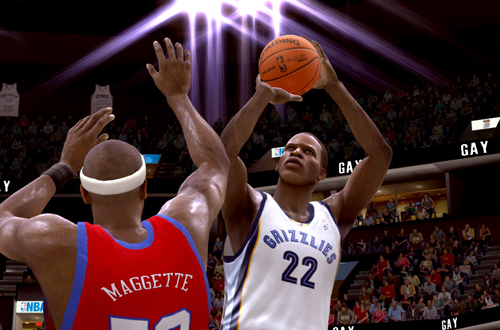 2K also experimented with a flash that appeared in the player indicator at the perfect release point, before adopting the full shot meter. Improvements in technology also allowed jumpshots to become more aesthetically impressive. In most early sim games, players generally used the same lone shooting animation. Around NBA Live 2003, EA started including a regular animation and “big man” animation, with a player’s dribbling rating determining which shot they used. Individual shooting animations, often referred to as “signature” animations, started to become commonplace around the time of the seventh console generation, providing added realism and greater player differentiation. Recent NBA 2K games also include a jumpshot creator where animations can be combined for unique styles. Implementing signature shooting styles did present a challenge as far as the overall mechanics, since the length of time you had to hold down the shoot button to hit the ideal release point now varied from animation to animation. The idea was to learn the animations of the players you were controlling, but that often felt inconsistent to the point of artificial difficulty. 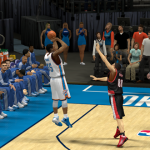 The indicator flash in NBA 2K13 and NBA 2K14 helped, but wasn’t quite as effective as it could’ve been. NBA 2K has settled on different shot meter speeds depending on the shooting animation, while NBA Live has separated its shot meter from the animations entirely. Both approaches have proven effective. Another challenge developers have faced with the shot meter is how it affects the dice roll for shot success. As demonstrated by NBA Elite 11, and to a lesser extent, NBA 2K17, giving users too much control over aiming facilitated cheesy shots. NBA Live 16’s percentage-based shot meter that depended on ratings and how open a player was did have merit, but also confused some gamers. NBA 2K18’s approach of nerfing not-quite-perfect timing led to “Good” releases with a 5% chance of going in. Both games currently use a meter with guaranteed makes on Green releases, and a sliding scale of success for early and late releases depending on ratings and defensive pressure. It’s a good method, but it’s not without controversy. Not all gamers are fans, feeling that shot meters make the game too easy. Fortunately, they can be turned off in the game options, and gamers can instead rely on the visual cue of the animation itself to identify and practice the perfect release point. Indeed, it’s recommended that you familiarise yourself with the shooting animations – especially the one that you assign to your MyPLAYER – even if you are using the shot meters as a guide. In terms of demonstrating the mechanics and providing feedback on how you’re performing on the sticks, it’s essential that the shot meter at least be an option in basketball games. It’s certainly helped my game on the virtual hardwood. For many years, shooting threes was a weakness of mine. I’d try all the tricks I mentioned above, switching between them as one approach felt like it was working, or no longer working as the case may be. The presence of a guide and immediate feedback after the attempt has made it easier to identify visual cues in the animations, and develop muscle memory with players whose shot I’m familiar with. It’s facilitated the more realistic style of virtual basketball that I’ve always wanted, though out of habit, I probably don’t take quite as many midrange jumpshots as players do in the real NBA. Even if you switch the meters off, you’ll find that shooting jumpshots is a lot more realistic in modern games compared to old ones. The hardest part of going back to old games for Wayback Wednesday features, or just my own personal enjoyment, is the need to avoid taking too many jumpshots. Otherwise, it’s all too easy to fall behind the CPU because they’re such low-percentage attempts. If you do feel that shooting has become too easy in modern games, turn off the shot meter or try switching from User Timing to Real Player %. There’s still some debate as to which is preferable as far as setting up the optimal sim experience, and that also depends on difficulty and sliders. Moving forward, I think the next big improvement to jumpshots in video games will be cutting down on lag in online play. After all, shot meters and feedback, visual cues, and refined mechanics don’t mean much in the face of a lag spike that hits just as you’re ready to let it fly. Balancing sliders, ratings, and booster mechanics such as Takeover in NBA 2K19 is also vital, but as far as the basic mechanics are concerned, jumpshots are now as viable as they should be. 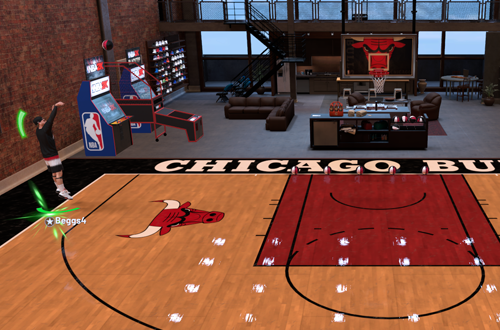 It’s taken a while and involved a few experiments along the way, but shooters can now scorch the nets from anywhere on the virtual hardwood or blacktop.